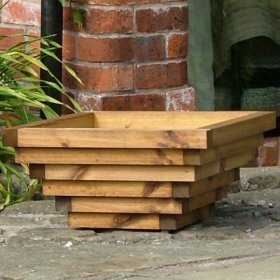 Wooden garden planters can be gorgeous and are about the best choice for growing your plants in. 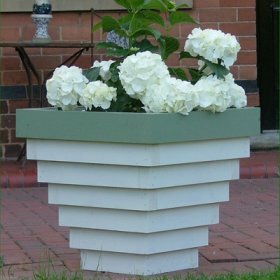 Planters constructed from timber are attractive, come in all sizes, are durable and widely available. Wood also has good insulating properties so doesn’t heat up as much as metal, plastic or ceramic planters, and also protects against cold and frosty conditions. 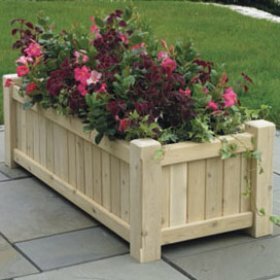 Plants grown in wooden planters are often healthier than plants grown in planters constructed from other materials, even if these planters are the same depth because the plant roots in wooden planters are better insulated. 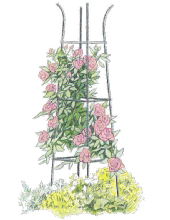 being very functional when combined with other garden features such as bench seats, wooden garden obelisks and trellis work. Timber is a natural renewable resource which is relatively durable and not likely to break or be adversely effected by extremes of weather. They are also easy to paint enabling colour schemes to be easily changed or for that personal touch that many like to add to their schemes. Timbers such as red wood and cedar are also used in the construction of planters and these timbers do not require painting or any preservatives so they are even more environmentally friendly. To help you select the best plants for your planters. Here is a list of two hundred plants, with pictures, for planters listed by colour & season. Traditional Planters, with sides that slope outwards slightly, have been used in gardens since the Roman times. Until recently, these types of planters were always made from terracotta, a once-fired, porous, red clay, which is very attractive but can crack and flake with weathering in very cold temperatures. Sometimes, elements are added to the clay before it is fired to make it frost-proof. If you live in a cold area where frosts are likely, make sure that the terracotta you buy has been treated in this way. Decorative, glazed ceramic planters, often from the Far East, Italy, and Spain, are now widely available. They come in a beautiful range of colours, but tend to be even less frost-proof, as glaze can easily crack. However many are frost-resistant so always check before you buy. As terracotta is a highly porous material, it absorbs a lot of moisture from the potting mixture; the moisture then evaporates into the air. Because of this, plants in terracotta pots require more frequent watering than plants in wooden planters. It is also advisable to soak terracotta pots thoroughly before planting them up, as it is essential that new plants have a plentiful supply of water to start them off. Small planters can often make more of an impact on a terrace or patio if they are arranged in a group. They need not be exactly the same design or size. Indeed, the grouping usually looks more effective if it consists of different-sized and shaped planters. Planters are also useful in herbaceous borders. Filled with flowering plants or colourful foliage, planters can add interest to a patch that lacks colour at a particular time of year. Planters can also help to introduce a little height to an area with low- growing plants or a newly planted plot. Simple spring bulbs, such as tulips, hyacinths, crocuses, and narcissi, are easy to grow in planters. They are not demanding and the cold rarely affects them. Only high winds and torrential rain, when the tulips are in bloom, can mar their brilliant display. Tulips have been highly valued for many centuries by gardeners, encouraging the bulb hybridizers to develop more and more forms. Bulb growers specify whether the bulbs are early, mid, or late season, but it is always a little hit and miss. To ensure that all the flowers in an arrangement come out at once, it is best to grow only one variety in each planter, unless you know the varieties well. Plant the bulbs in mid to late autumn, as soon as you get them home from the garden centre. Do not allow them to dry out. Provided they are in good condition, you can plant them up until early winter. Expect them to flower four to five months after planting. To get best results, plant fresh bulbs each autumn and move the old bulbs into the garden. twice as many bulbs in, and therefore have twice as many flowers later, giving a spectacular display.